To get the hearse wheels spinning, we’ll share with you one of the coolest indoor decorations we’ve seen: The Hallmark Haunted House Shadowcaster. Part tabletop display, part light show, this Hallmark creation is one-of-a-kind. The display looks great during the day, but really comes to life at night. Each window features a spooky silhouette that only appears when the display is activated. An evil enchantress cooks up a crazy concoction in the doorway, while jack-o’-lanterns stand guard on the porch. 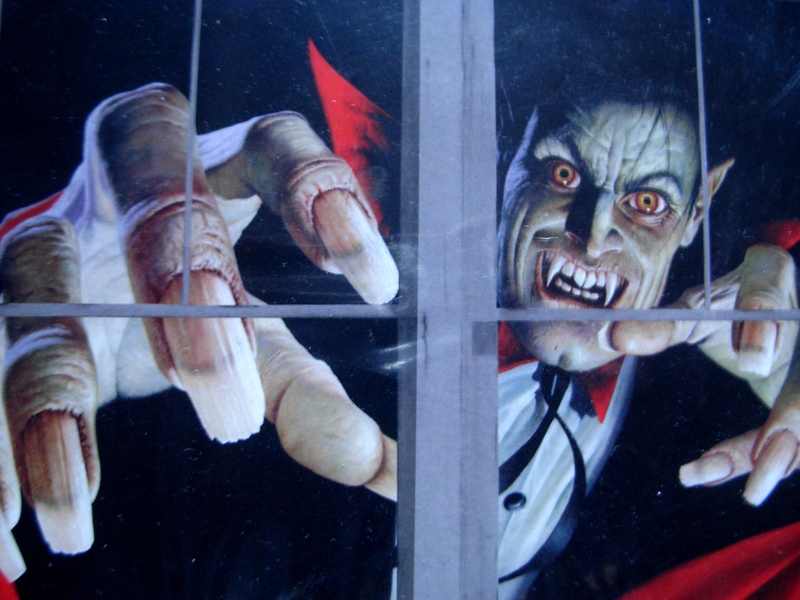 Cats, spiders, and skeleton-men haunt the windows, and a ghost hangs out in the rafters. Each characters appears with the help of a flickering LED light strategically placed behind the facade. However, the real treat is what’s behind the mansion: a flock of frightening fanged-beasts! Through the magic of modern technology, dozens of bats, of all shapes and sizes, are projected onto whatever is directly behind the house. Illuminated in orange and purple, the light show shifts between two basic positions (plus a third transitioning scene) and lasts anywhere from half-a-minute in “try-me” mode to an hour when the button is held down for several seconds. 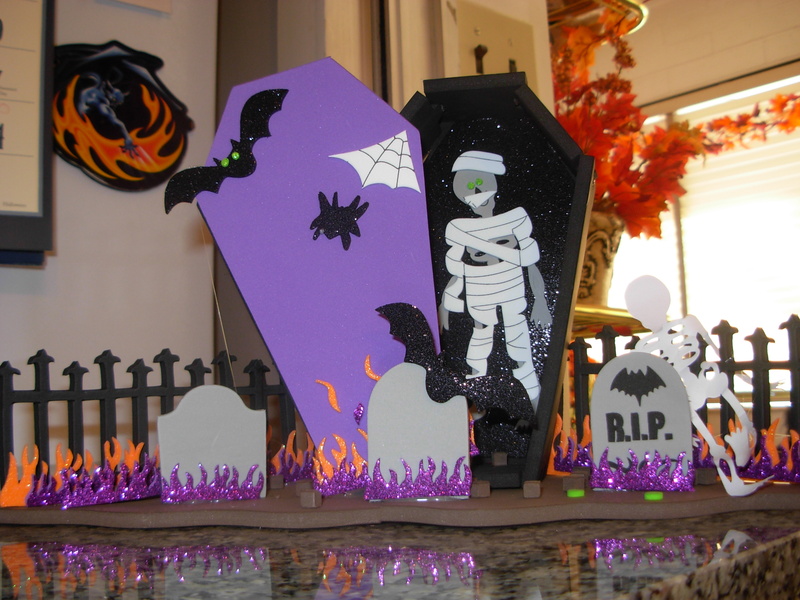 Although the house itself doesn’t seem too sturdy and the plastic it is molded in could be thicker, this is still a great little decoration that really captures the essence of Halloween and the magic of the season. It can be purchased for $19.99 at participating Hallmark retailers. This Halloween season is not unusual in the fact that the best products are not found in the traditional retail stores, but at the discounters. The TJX group (T.J.MAXX, Home Goods, and Marshall’s) has some of the most interesting offerings. In addition to the traditional devilish dinnerware and lethal linen, they are offering up both vintage-inspired designs and classic Gothic elegance. The most unique pieces at HomeGoods and Marshall’s, though T.J.Maxx does end up with some of the overstock. If you love to keep things dim and grim, you may be interested in some of the faux-stone busts and statues. Or perhaps creepy candelabras are more your thing. They have plenty to choose from, including this one that comes complete with LED candles. Battery-operated, it retails at $24.99. The light is that harsh, cold, traditional (almost blue) LED style, but it’s ghostly in its own undead way. The next offerings come from Christopher Radko. HomeGoods usually carries his vintage-reproduction line of ornaments named after the famous “Shiny Brite” Christmas ornament company. This year, they serve up some Halloween-themed bulbs that would be perfect for any vintage display or Halloween tree. In addition, they also have several wooden tabletop and wall pieces with artwork taken right off of early 20th century postcards, like this lovely little witch pictured above. The main rivals of the TJX group, Ross and Tuesday Morning, have fewer options for the season of the witch, but — every now and then — a spooktacular find materializes. Such is the case with Tuesday Morning’s Original WoWindow Posters. 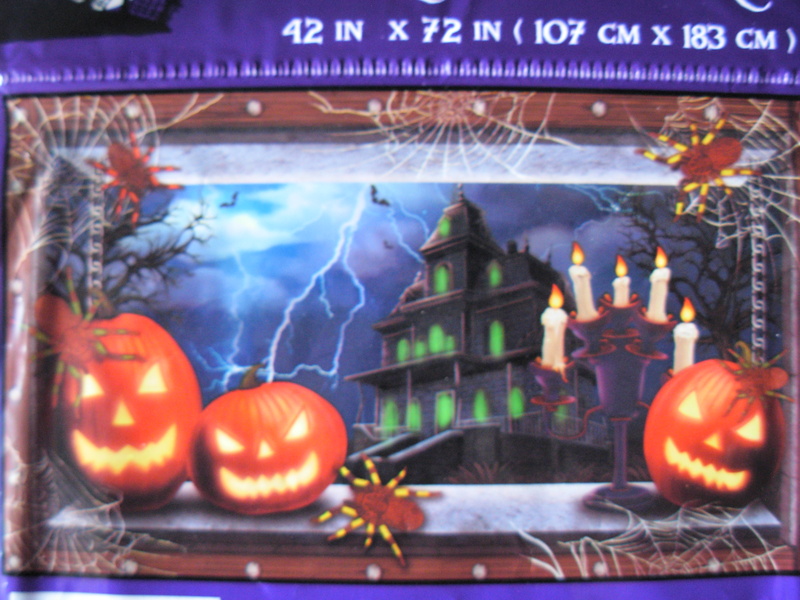 Usually only found at the big name Halloween stores, Tuesday Morning is offering up two discontinued designs. The creepiest of which is the “Vince the Vampire” two-poster set. When they put “Wow” in the name, they aren’t kidding. One of the posters in this set could almost cover an entire door. Now imagine two of them at that size! These massive decorations really fill out and (fill up) any window, wall, or door. The first poster features the vampire’s giant face. The second is a continuation of his body, with his hand taking up the majority of the second display. What is most notable about this poster is that it is not made with the same cheap plastic you used to find in this type of decoration. This is made of a thicker, heavier film, which makes it great for use year-after-year. The best thing about it is also the biggest drawback: the size. Unless you have giant windows, it will be hard to place this set. Fortunately, you can put up the one poster with the vampire’s face and get a decent effect. At $4.99, it’s hard to pass up. While the regular retail offerings have been rather lackluster this year with Target, Walmart, and Spirit all failing to deliver on any noteworthy level (not to mention their tardiness in actually putting anything up in their brick and mortar stores), the dollar spots have not disappointed. Usually, Dollar Tree has some of the greatest “cheap” decorations. 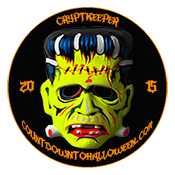 While they do have a few really awesome things that we will be highlighting in two days, 99 Cents Only is this year’s ultimate creep spot. From outdoors to indoors, they provide wall-to-wall creeps and plenty of hot-and-cold running chills. 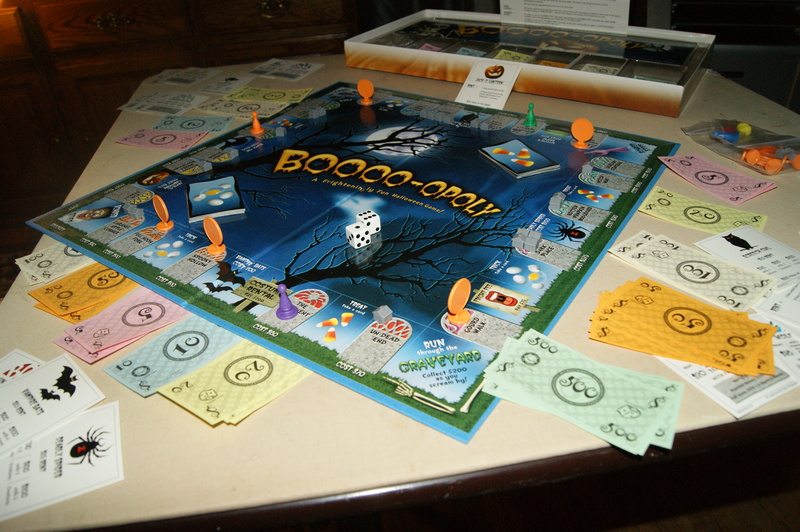 Dollar Tree used to be the king of cardboard tabletop decorations. Now, 99 Cents Only has taken that honor and added some ghoulish delights that are certain to bring death to the liveliest of tables. The most notable table centerpiece is the one you see pictured above. Bats, black cats, and ravens surround a classically-designed haunted house. Unlike some of the Dollar Tree decorations and the previous 99 Cents Only decorations, this piece solves the problem of folding edges and unaligned pieces by having a multitude of supports. There are basically three layers to this piece, all adding to the spookiness of it, but also supporting the thin cardboard structure — an ingenious evolution of the dollar centerpiece. It retails at 49 cents, but prices may vary by location. 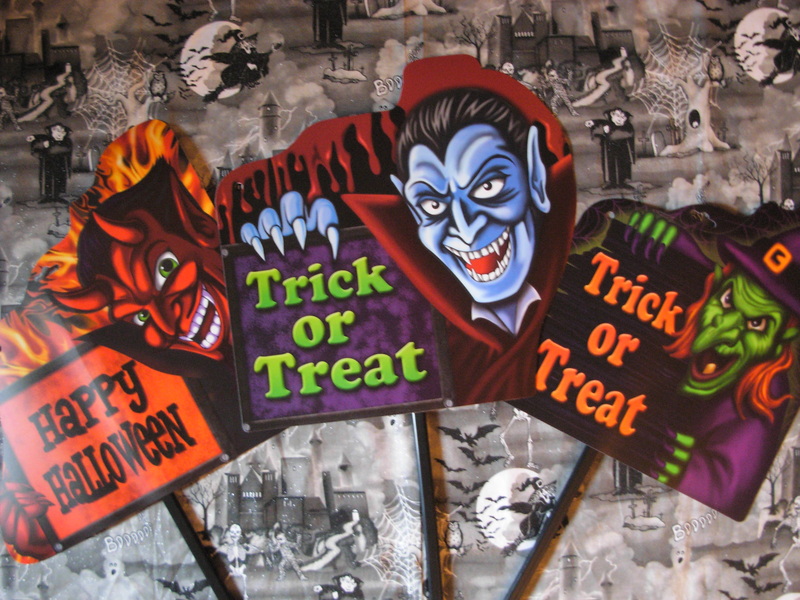 99 Cents only also has some cool outdoor decorations, from window posters to door-covers to these Halloween yard stakes. They are fairly sturdy — especially for a buck — but they won’t last in the ground if you live in a blustery area. They are large enough, however, to make good wall signs. Made of a coated plastic that is more weather-resistant than some of the other outdoor signs around, these are pretty nifty. 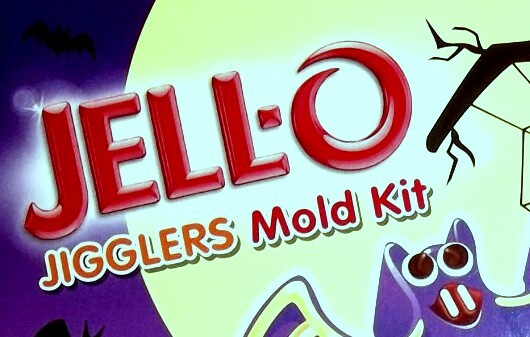 They come in four designs: vampire, witch, devil, skeleton; and they retail at 99 cents each. 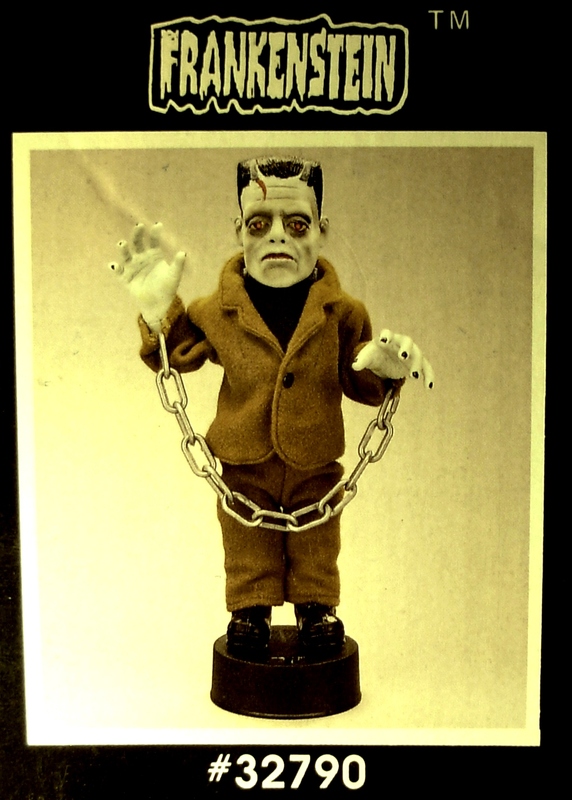 These Frankenstein decorations are now available at 99 Cents Only. One is a jointed tabletop figure that is being sold at closeout. The other is a plastic wall poster that retails for 99 cents. 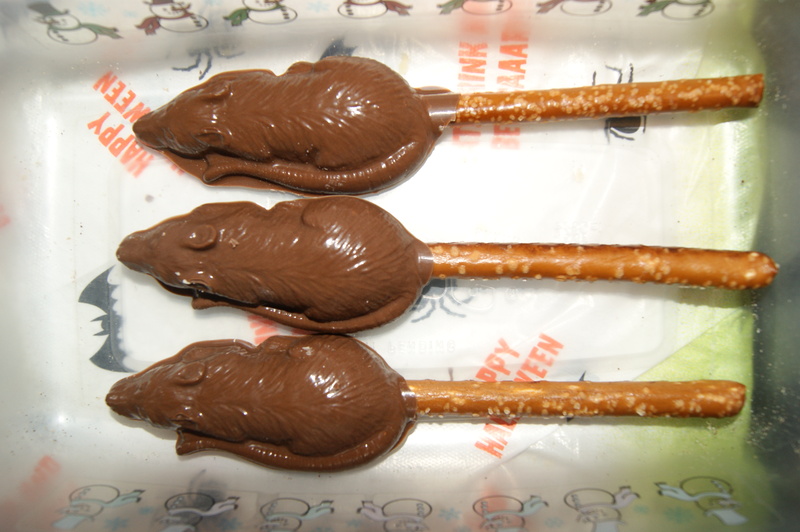 We’d say more, but we think we’ll let the pictures speak for themselves. Dollar Tree has a wide variety of window clings, plastic toys, and cardboard characters, as well as some interesting 3-D decorations made out of wire and tinsel. They have felt cutouts, plastic skulls, and foam tombstones — basically all of the usual suspects. 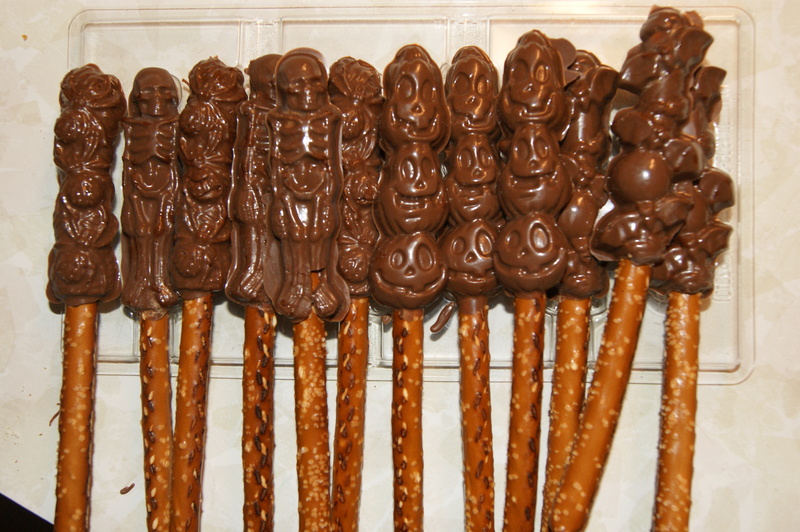 So what are the standout items at the one-dollar-retailer this Halloween? Surprisingly, napkins. Napkins and paper plates. 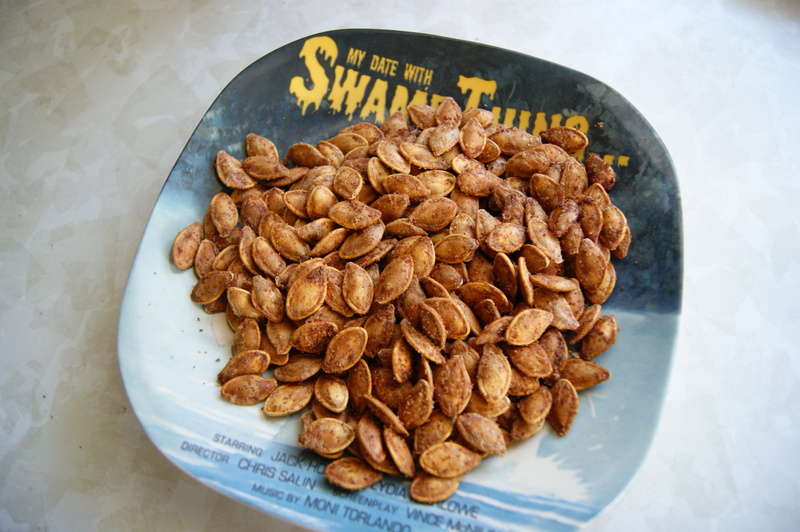 For years, it seems, Dollar Tree has been pitching the same basic pumpkin party plates. This year, that has all changed. 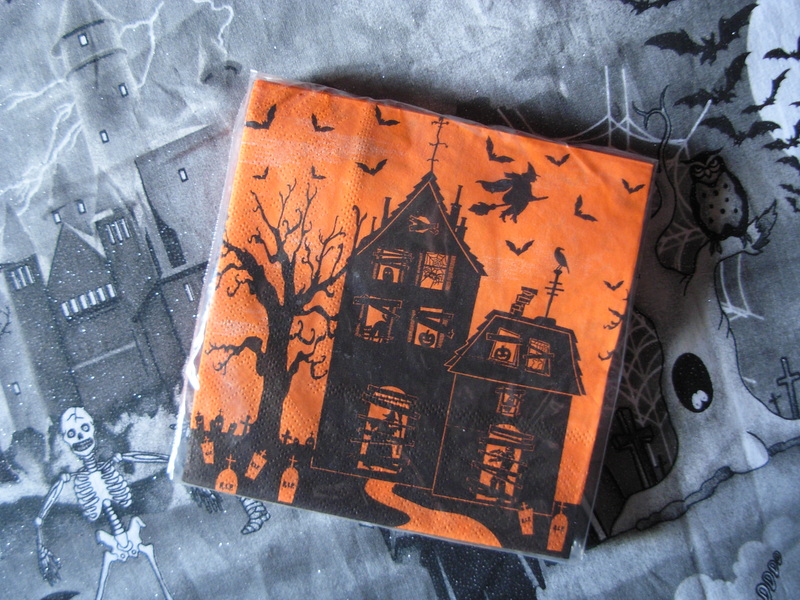 They not only have these great ’80s-inspired Haunted House napkins (pictured below), they also have a full set of paper tablewear (featuring a raven and a rat) that is far superior to any party goods in the big box stores. In addition, Dollar Tree is offering up massive window posters, much like the ones from Tuesday Morning, only less durable and… busier. In the case of the Bates Mansion poster, however, busy is somewhat acceptable, Wait… Yes… You heard correctly: BATES MANSION window poster. No, it’s not licensed, but the house pictured on the poster is clearly inspired by the one Norman and Mother call home, or maybe even Phantom Manor at Disneyland Paris. While the house is the centerpiece, it is surrounded by giant tarantulas, jack-o’-lanterns, candelabras, and lightning — virtually every spooky thing they could fit So, no. It’s not going to win any art awards, but it has a creepy haunted house on it! How can you beat that for a buck? More than anything, it’s reminiscent of a somewhat garish store display for soda, chips, or some other Halloween-themed party treat… and this is really why we love it. Also, did we mention how massive this thing is? It’s huge. Turned on it’s side, it could easily fill a doorway. If you do pick one up, good luck placing it!